Euro is still consolidating. We can’t exclude a possibility that the current correction may finish in the area where there are several fibo-levels and the price will start moving downwards again. The target area remains the same – it’s the area, where there are 4 fibo-levels from different fibo-extensions and backward corrections. At the H1 chart we can see, that there is a new extension. The level of 100% is close to the upper border of the target area. According to the analysis of temporary fibo-zones, predicted levels may be reached by the 1st or 2nd of May. Franc started a new local correction. If the price rebounds from the level of 38.2%, the pair will start a new ascending movement. Take Profit on my short-term buy order is placed in the target area, where there are several fibo-levels. 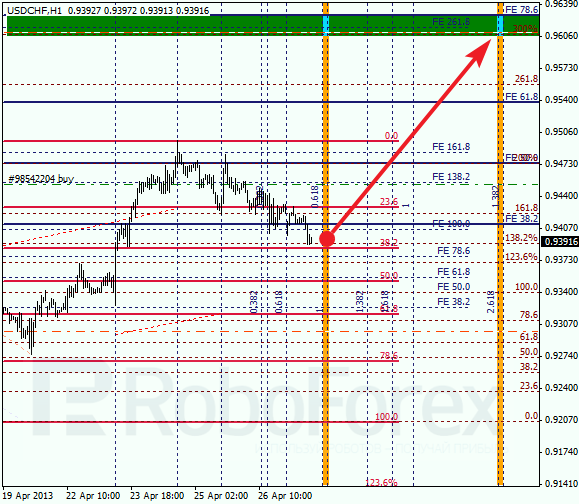 At the H1 chart, we can see that temporary fibo-zones formed several targets. The first one is the target of the current correction, which may be reached by the end of the day. Other target levels will probably be reached by the end of the week.